So I was at Green City Market today (have the quiche from Floriole Bakery— see below) and I soon filled up my LTHForum canvas bag. And wished I had another. Especially with plastic bags becoming this year’s foie gras, soon to be outlawed (in the absence of any other more pressing problems here in Shootcago). Yeah, I could have found a bag anywhere. Whole Foods, even Jewel has them. But having a little money left over at Cafe Press from the sales of LTHForum swag, I had a better idea… make my own. I don’t plan to pimp a full line of merchandise but this, at least, makes a lot of sense and is something useful. 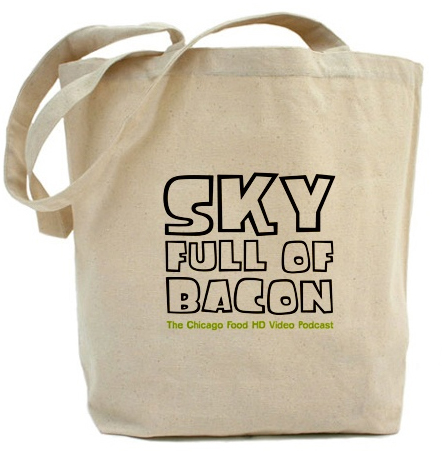 So now you too can be one of the very few cool cats carrying a Sky Full of Bacon bag to the farmer’s market. They’re $13.99, a whopping dollar goes to support your favorite HD podcast, to order one, click here. Anyway, Floriole Bakery. They don’t get as much attention as some of the other bakeries that pop up at Green City but I am always very happy with both sweet and savory stuff I get from them. Today it was a gooey custardy scrumptious quiche, about three times as tall as your usual quiche, full of goat cheese and tomatoes. And for a sweet, a thing called a cannele, called that because it’s made in a mold like a candle, a vanilla-flavored batter baked until it has a tough outside and a custardy interior. I heard the woman who was running the stand say that the owner has been working on it for a year, but the recipes were old and rather vague, and only recently has she felt like she reached the point where it worked. She was right, it does. Not bad for $7.50. Okay, I’m not sure if anyone looks at this blog per se, it mainly exists to facilitate the videos, but if you happen to see this, I’d be interested in any feedback on the following. Got a comment back from a local writer-editor person who basically said the Sun Wah video podcast was sort of interesting— but too long. Now, I’m sure there are lots of people who will find 15 minutes on a Chinese restaurant too long… because they’d find two minutes on a Chinese restaurant too long. Fine, it’s not for them. But basically one of the things I’m trying to demonstrate here is that online video doesn’t have to be 54 seconds of online goofiness on YouTuber, that you can do things that have the feel and cohesiveness of a feature piece in a magazine, or a short story, or an NPR interview, in a sit-at-your-desk-and-watch-it setting. For me, 15 somewhat methodical minutes on the family behind a Chinese restaurant is easier to take than the 22 minutes (plus commercials) that make up a typical food TV show, in the course of which we’d flit between five different places, cut every two seconds and get whiplash from the ADD camerawork. I find those kinds of TV shows much harder to sit through for very long than the videos I’ve made, but obviously they have some kind of audience which responds to that kind of pace or at least, once suckered in, is too dazzled by flashing bright colors to change the channel. For me, I want to make things that let you go behind the scenes and really get to know a single place and the people involved— within the limitations of a 10 to 20 minute running length. Basically it’s an interview show, but with pictures. Of course, an audio podcast you can just have on in the background, so it’s okay if it runs on a bit; a video one has to be more focused and compelling minute to minute, because you’re sitting there looking at it. So where nobody would be bothered by a 30 minute audio podcast, I want to keep video short enough that it’s over before you’re tired of it, more in the 15 range. But still, I refuse to let YouTube set the expectations for all video online; I’d rather have 1000 people watch something meaty (and that’s about what the first podcast has reached) than have 100,000 people watch something catchy but stupid I happened to make. So what do you think about length, depth and the prospects for video online? And about the length and pace of the two Sky Full of Bacon podcasts to date? City Kid Turned Farmhand Goes To County Fair! A while back I posted about my son Myles’ adventures raising a lamb in 4-H, and posted a video of him working with his lamb Triska. Now here’s the rest of the story, as he takes Triska to the Lake County Fair for auction. It’s about 5-1/2 minutes long. Triska Goes to the Fair from Michael Gebert on Vimeo. AND ANOTHER: Thanks, new MenuPages blogress Helen, too. LATEST UPDATE: I just noticed this because I was on jury duty all day, followed by having a very large beer and watching TV duty, but Bill Daley linked to the new podcast at the Chi-Trib’s The Stew early this morning. Thanks, Bill! Thank you, Gaper’s Block, for the double shout out for both the new podcast and the Maxim item. UPDATE: And thanks to Mike Sula for revealing my diabolical plan as he links to both the new podcast below, and to my largest piece for the Reader ever, about a combination barbecue/soul food place I discovered while driving around one day. It’s called P&P BBQ Soul Food and it’s pretty darn good at both, not to mention interesting because of its owner— who’s blind. Read the whole thing here. Go inside a Chinese restaurant to learn not only how Peking duck is made but how traditions are passed from immigrant father to Americanized daughter in the new Sky Full of Bacon podcast. Sky Full of Bacon 02: Duck School from Michael Gebert on Vimeo. Sun Wah BBQ has been serving Chinese barbecue— chicken heads and all— for 22 years. I talk to Eric Cheng about how he settled in the Vietnamese “New Chinatown” on Argyle Street on Chicago’s north side, and to his daughter Kelly, who with two of her siblings is training to take over the restaurant— introducing new ideas of her own along the way. It runs just over 15 minutes and I think you’ll find it an interesting look at the generational changes lurking behind the smiling facade of a Chinese restaurant— and to all the work and thought that goes into a seemingly straightforward dish like barbecued duck. There are too many LTHForum threads to link, but these Ronnie Suburban pics (including Kelly directing her father and brother in roasting a pig) are particularly good. P.S. Big bloggy thanks to Joe Germuska for his help in making this iTunes/WordPress/RSS stuff work the way I want it to. If it does this time, thank him. Also recommended: the services of Maggie Gyllenhall’s airbrusher. Argyle Street’s venerable Sun Wah will be the subject of the next Sky Full of Bacon, which I had planned to finish for when they reopen from vacation, which is tomorrow. Instead, I’m on jury duty. So maybe by the weekend. I’d also planned on reading the rest of Michael Pollan’s book while sitting downtown earning my $17.20 for the day, and posting about that, but instead I got empaneled, as they say. Meanwhile, I’m also working on one about foraging in the Chicago area. So if you happen to do any of that kind of thing, contact me (leave a comment or mikegebert circle-a gmail point first-syllable-in-Communism). And I have an exciting restaurant discovery (well, for some of us anyway) which will be in the Reader in the issue after next– stay tuned for more…. LATEST UPDATE: Thanks, Mike Sula of the Reader! For more info about what the heck this is about, go here. 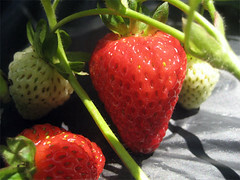 Strawberries from my Earthboxes at home. I just thought this post needed a pretty picture. 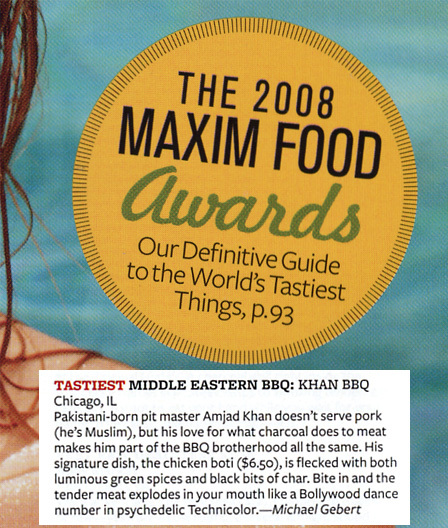 …because I beat the cultural ubiquity of bacon by one week, apparently. both encouraging and dismaying. In one sense it’s the usual trivial self-absorption of the chattering classes, “discovering” something that has been part of American life all along; discovering bacon is like discovering oxygen or money. And so they can’t just say “Dad was right, damn, bacon’s tasty!” but they have to turn it into something transgressive and tattooable. But of course every sinner eventually reforms. The people getting naughty with bacon today will be humorless scolds about it again tomorrow. 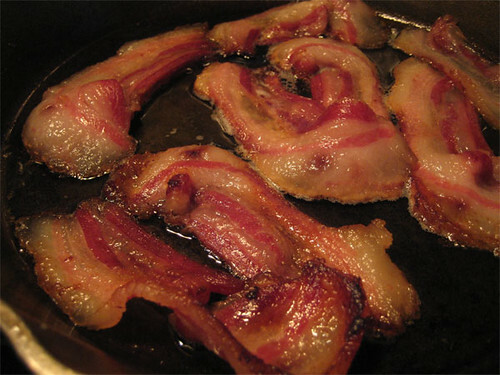 I stand for bacon as a relatively morality-free thing; we are carnivores, bacon is a delicious meat, I wouldn’t try to live on it but really, a few slices once a week will not kill you and they won’t make you a 21st century meat version of Hef, either. It’s just bacon. Don’t blow it out of proportion. What the media giveth, the media will taketh away tomorrow. What a great show. I am a happy subscriber. It got me thinking how much things have changed since the first “back to the land” movement in the mid-seventies. At that time, I was 9 years old and had just moved to a 40 acre organic farm. I took to gardening like a duck takes to bowling. For me, butchering chickens will never, ever be a fun thing to do. Still, I came to know where food comes from intimately. 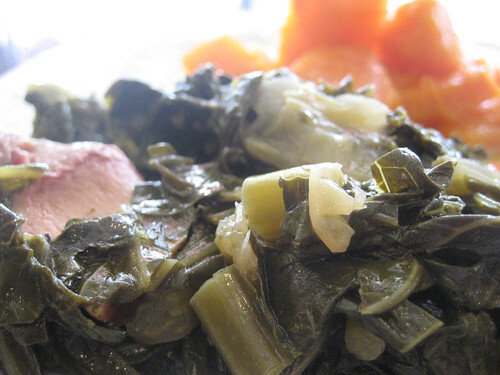 The same concerns about where and how we get food are still with us. However, where in 1974 l learned some things from Frank Alfrey, who lived across the gravel road, was 90 years old, and had originally cleared the land by hand with his brother, now there aren’t as many left who can explain the right way to plant potatoes. After 14 years living in the City, I’m not sure I could even get dandelions to grow. I wish you much success finding an audience. There are a lot of people who need to spend time thinking about this stuff.